Today my sister Samantha has dropped by to review The Music Of What Happens by: Bill Konigsberg. "Max: Chill. Sports. Video games. Gay and not a big deal, not to him, not to his mom, not to his buddies. And a secret: An encounter with an older kid that makes it hard to breathe, one that he doesn't want to think about, ever. Over the course of one summer, two boys will have to face their biggest fears and decide what they're willing to risk -- to get the thing they want the most." So it’s been awhile since I made an appearance on here, but I am back nonetheless with another amazing book to talk about. 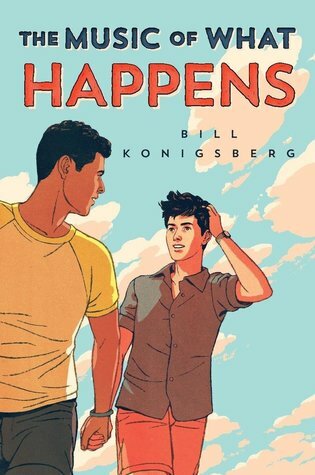 The Music of What Happens by Bill Konigsberg had me feeling Adam Silvera book levels of feelings, which, if you’ve read reviews I’ve written about his books, is a very good thing. This book made me laugh and cry, or at the very least, tear up. The story follows Max and Jordan, who meet while Jordan’s mother is having a meltdown on their old food truck. Max agrees to help on the food truck, deciding that was better than working for State Farm all summer. At first the two don’t get along, but over time form an unbreakable bond. The two have their own traumas to deal with that make guiding their way through life much harder and the two definitely needed each other in ways they couldn’t realize when they first met. I have to say my favorite aspect of the book was how accurately the author depicted the voice of teenagers in 2019. It had humor that I use daily with my friends. It had memes and teen culture without feeling forced and cringey. It felt actually relatable, especially in that Jordan and Max both struggle to find the balance of joking with their friends versus when it’s time to be serious and how to deal with those moments when they come up. Even the way they talk about these problems felt relatable, although I had not been through these scenarios myself. They opened up, but also tried to almost act like it isn’t a big deal, because even around those we feel comfortable with, talking about our feelings is hard, especially when our feelings are tied to the things Max and Jordan are forced to deal with. Would I recommend this book? 100% yes. It was funny and sad all in a perfect balance. The ending was sappy and happy, but also very realistic in that nothing is perfect, almost nothing is right at all, but it feels okay when we have the right people to support us. It’s a nice message to take home as a reader. I think if I had to give one reason to read this book for non-emotional or moral of the story reasons, it would be because Jordan’s sense of humor is so perfectly strange and out there but thoughtful it’s fun to read, he’s such a loveable character and anyone can see themselves in either him or Max no matter what they’re going through.